When you look at the way you approach life is your attitude a healthy one, and inspiring one? Where could your attitude serve you and all around you in a better way? It is in these moments of contemplation where enlightenment occurs. The world needs us to wake up now and show a light on all is dark. 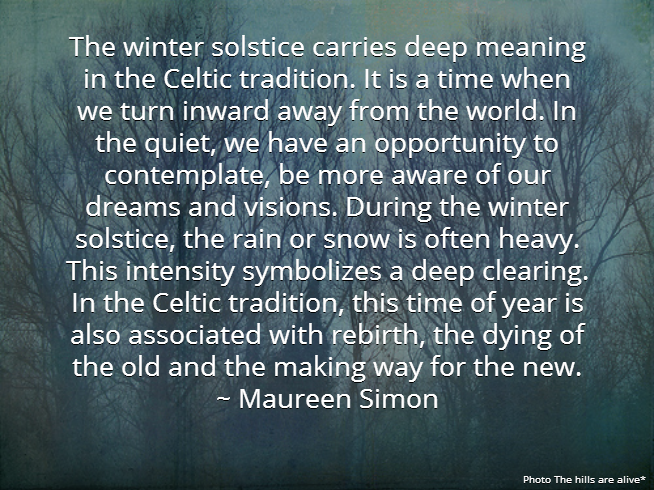 The winter solstice carries deep meaning in the Celtic tradition. It is a time when we turn inward away from the world. In the quiet, we have an opportunity to contemplate, be more aware of our dreams and visions. During the winter solstice, the rain or snow is often heavy. This intensity symbolizes a deep clearing. In the Celtic tradition, this time of year is also associated with rebirth, the dying of the old and the making way for the new. Where in your life are you experiencing a deadness or stuckness that you are now willing to release? Are you allowing enough down time and quiet in your life to allow for contemplation and inward reflection? What barriers are you willing to take down, where are you willing to open your thinking? Where are you willing to expand in your life at this time? 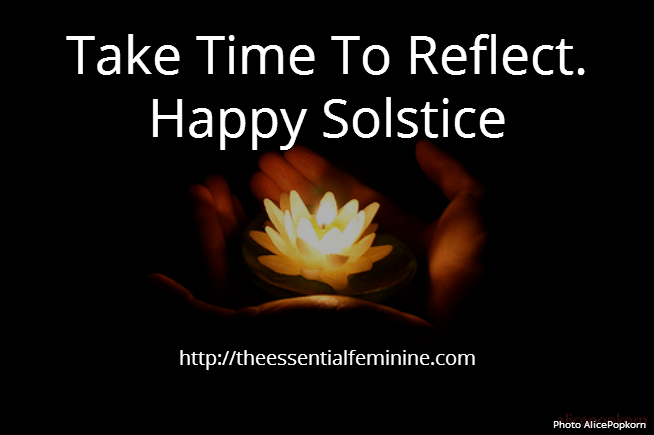 Please share your answers or join The Essential Feminine Community on Facebook and share your thoughts there. Rudolph Steiner has give us reason to look closely at where we are in this sacred solstice week. Uncertainty serves as one of our greatest teachers. When we see it as an opportunity to regroup. In a world that moves fast and places great pressure on us, we tend to need to know, to control. Control and knowing serve as crutches or security in a world where we really truly know very little and need to be prepared to live from a place of unknowing. Are you willing to consider looking at uncertainty in a new way? Could you see it as a friend, an ally – and opportunity? 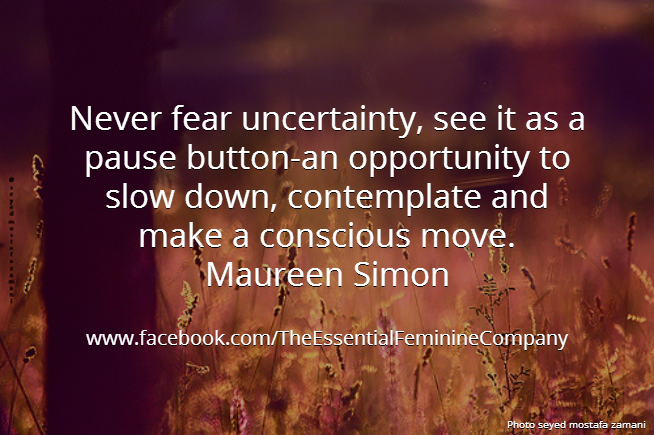 What uncertainty are you faced with now? What is the message or teaching that the uncertainty presenting to you? Where could you apply greater trust? What would be the next right action? Maureen is founder of The Essential Feminine Company™ (TEF)-a lifestyle and business design company that supports women to create successful powerful lives that incorporates their feminine attributes and gifts. The company provides learning environments and products that support women in claiming, living and leading with their natural strengths and talents. TEF believes that it is now time for women step forward and makes a major contribution in the world. Maureen’s experience with women is based on over 25 years of successfully mentoring and guiding women leaders from around the world to create successful lives and businesses that reflect their values. As a social alchemist she addresses women’s pertinent issues of social change and transformation. Her work as a pioneering consultant supports women to reduce economic stress, open new channels for their personal and business expression and enhances their ability to access the deeper powers and gifts that each woman holds within their feminine essence. As a highly intuitive business and life designer, Maureen incorporates principles of mysticism, alchemy and social entrepreneurism to achieve focused outcomes and results. Join Maureen on Facebook and Twitter. Sometimes we slip into playing and living in a much smaller and safer way than we are really here and capable of living. The key to moving beyond this place is to get conscious and to begin to really live the life we most desire. For many of us this desire may feel distant or faraway or perhaps we have been there but lost our way and need to regroup. We often get cues or hints in or daily life that gets us thinking – am I happy, is this life really working for me? Some of us freeze like Bambi in headlights when we hear these messages and stay small- as change can be uncertain and staying where we are seems safer. Some of us reach overwhelm and question our whole life, its meaning and purpose. We all get a moment of pause that allows us to question how we are really living life. Experience a reoccurring sense that there is more to life than the way I am now living. Always listen to these cues because they provide invaluable opportunities and subtle openings for change and lasting success. Recently I realized that I had a lot on my plate and that my priorities and my ability to accomplish what I needed to accomplish while still loving my life was becoming a challenge. I had one of those niggling feeling that something was not right. I had to stop- slow down – listen – take the bull by the horns and reprioritize my days based on what I truly desired most- that aligned with what I value most. So where does getting VERY clear on our desires enter into the picture? What we desire is central to designing a life of success and meaning. When you understand your deepest desire (and have tested it to see if it is linked with your highest reason for being here -your destiny) your life will take on a new rich meaning- fulfillment will be central to your every day. You then know that you are on the path to a life well lived. First be clear about your dream– what do you really want to accomplish (be it in your life or a given month- the art here is clarity about what you want! Next, take small measurable steps to build more of this dream into your day (find a teacher or mentor who has already accomplished it, research about it – to build understanding. Do whatever you can to make it real. See yourself already there- picture yourself living or accomplishing this great desire ( it really helps to take the distance and blocks away). As you become more comfortable and familiar with the desire it slowly becomes apart of your world. Notice coincidences and synchronicities….these are gold dust. Every day there are signs, messages and intuitive knowledge available to us. We must be proactive and invite this wisdom in and use it. Close each day with a review of what was wonderful about the day and aligned your day actually was with your greatest desires and values. We are living in an era where great consciousness is needed. Be very conscious and very intentional. These days that we are living in are absolutely amazing. We have many choices available to us each day. Live life fully. It is your choice. Let me know if I can be of help. 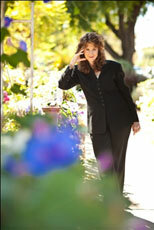 I am committed to your success- your success from the inside out! Contemplation, Meditation and Inner Reflection ~Our True Guides in a Fast Paced World? Contemplation and inner reflection for many of us in this fast paced world are foreign concepts –from the past or maybe states of mind for monks. These past two years have been very active for me and in retrospect I have been looking at the inner lifestyle supports that I have turned to that have helped me to create and live so many of my dreams as I have been designing and co-creating The Essential Feminine Company. (www.TheEssentialFeminine.com). During the past two years I have had to find ways to stay grounded and open to innovation, peace and the quality of good living that I so value. After two very fast paced years I must now in retrospect acknowledge that my time spent in the quiet mornings in contemplation, meditation and inner reflection have not only been my life savers for creating inner peace but my well spring for creative ideas. This reflective time has been the place where I receive powerful ideas and guidance that leads to inspiration. Contemplation, meditation and inner reflection have actually become essential to me daily as I have been stopping and listening most mornings in quiet- to hear what is most important and what signs thoughts or repeated patterns are occurring. I now realize how this guidance and information would go right by me if I did not stop to listen and assimilate. I can now see what a huge price we pay in this world when this time is not taken – for each of us personally and for us collectively on the planet. Taking time to relax and listen- I believe—is where we gain and access so much rich knowledge and wisdom. Imagine if everyone stopped and listened each day! I wonder how our world would be different. In the past five years-I have noticed how evolved we have become in the areas of thinking and analyzing – as we live in the fast paced information age. Our minds have adapted to these great skills as a way of receiving information for the guidance we turn to make so many of the decisions in our daily lives. But these are only part of the tools and resources we need to be referencing if we desire to live the amazing, intuitive and guided lives that I believe we are meant to live. 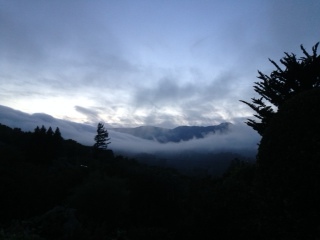 v In the morning create a peaceful place to sit- contemplate –gather yourself- a place to -be present. v Build time into the morning to sit still- learn a practice to support you. (I find Andrew Harvey’s Book-The Direct Path- a fountain of inspiration and resources for stilling the mind and looking more reflectively at life). v Make time to include some contact with nature each day. v Experience the light, joy and peace throughout the day- some days we actually have to keep an eye out for it! v Notice when you are rushing… breath – slow down in that very moment. Value the time you make for you –as a precious gift to and for yourself! Be conscious of how you best create quiet in your life—Go with what works and do more of it! v Clarity- notice if things are clearer in your life. Are you seeing things differently? Getting more information? Please do share with me any changes that you may be experiencing in your life. Just two days of being “tuned in “should yield results! (See our courses that support the above on www.TheEssentialFeminine.com).